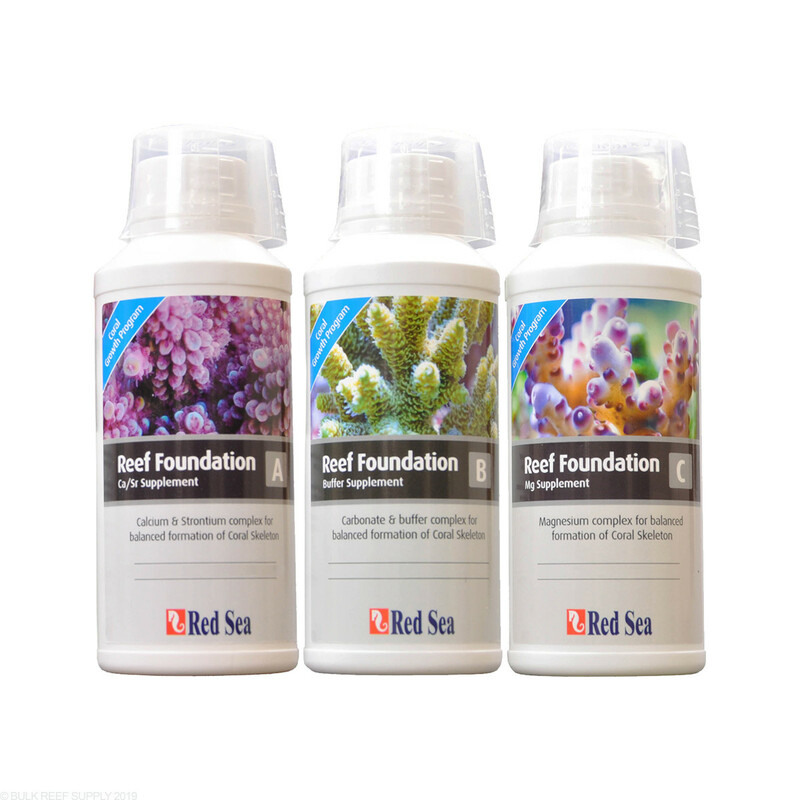 Dosing trace elements cannot get any easier than the Reef Foundation System. 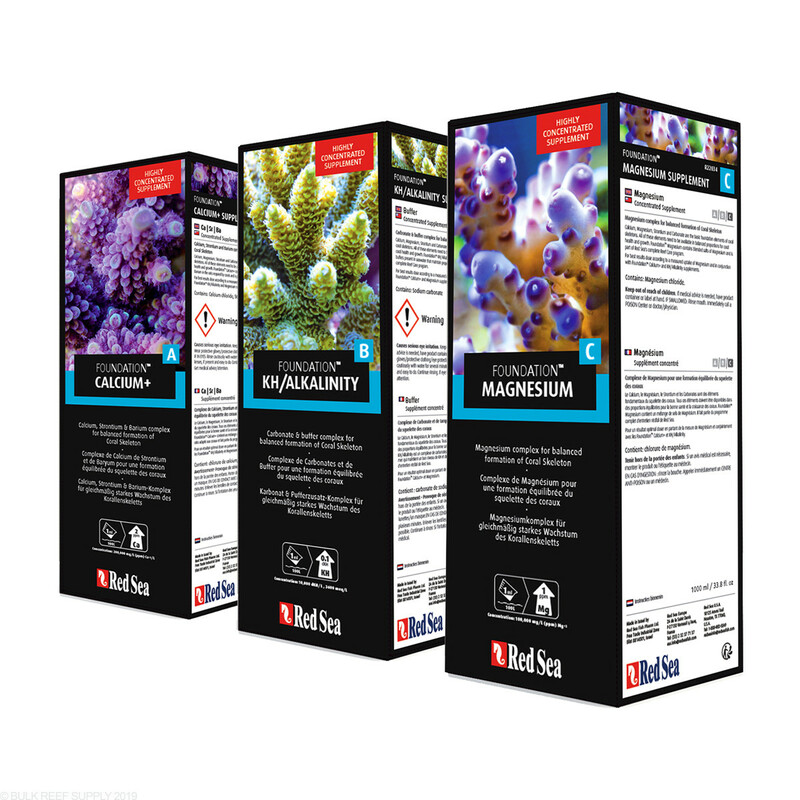 Red Sea uses a very easy to follow, systematic approach to maintaining what your corals need to grow. Red Sea's Reef Foundation system has been designed to help promote coral growth and coloration while maintaining the health of the coral. When corals grow, amounts of calcium, alkalinity, and magnesium will be consumed by the coral to create its calcium carbonate structure. With just a couple small corals the amount of elements that will be consumed can be replenished by water changes, but after corals start growing, or you add more the need to supplement and replenish the elements being consumed will arise. Calcium, alkalinity and magnesium will be consumed the quickest and the Red Sea Reef Foundation System uses high quality components letting you replenish the basic trace elements that are being consumed. Reef Foundation A: 1 mL will raise the Calcium level of 25 gallons by 2 ppm. Reef Foundation B: 1 mL will raise the alkalinity of 25 gallons by 0.036 meq/l (0.1dKH). Reef Foundation C: 1 mL will raise the Magnesium level of 25 gallons by 1 ppm. I have used Red Sea foundation elements on my 24g tank since 2017, and it has been great! Very easy to get the right dose every time, and the concentration is high enough to only need a few ml daily. It's convenient for me because I have a 30 gallon reef and it's pre-mixed and easy to use. I have a 75 gal display tank. My readings were very low. I have not set up a dosing station yet, but in the meantime I am using this kit. It took a lot of product to get the readings right but after the system leveled out, it hasn't been so bad. Corals are growing much faster and are much healthier now. For how long you can have this product after buying ? This item has no expiration date. Have a great day! Are these a liquid or powder? Is it normal for the calcium bottle to sound like it has gravel shaking around in it? As this product is made from crystalline calcium salts, and due to the concentration of material, it's not unusual to sometimes have a little extra salt left in the bottom which is not dissolved completely. The solution is still completely usable and does not indicate a problem with the solution.